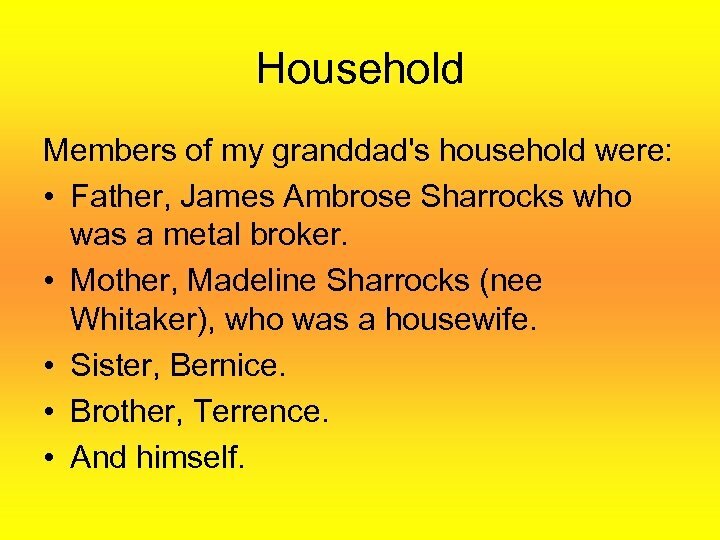 Household Members of my granddad's household were: • Father, James Ambrose Sharrocks who was a metal broker. • Mother, Madeline Sharrocks (nee Whitaker), who was a housewife. • Sister, Bernice. • Brother, Terrence. • And himself. 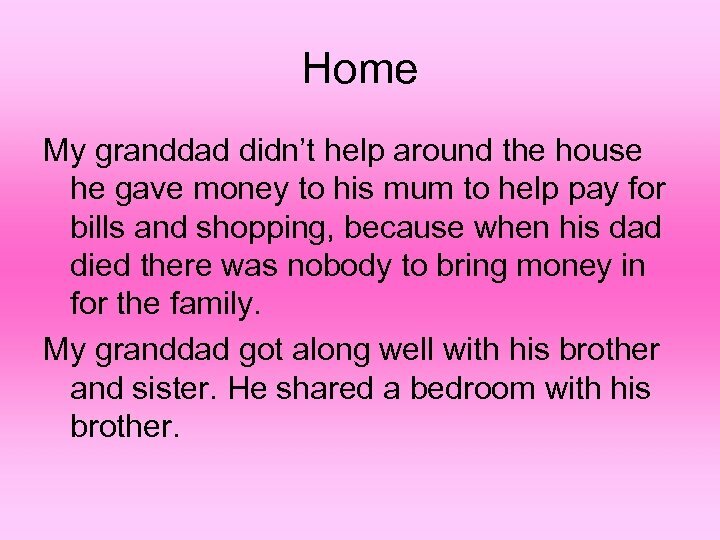 Home My granddad didn’t help around the house he gave money to his mum to help pay for bills and shopping, because when his dad died there was nobody to bring money in for the family. 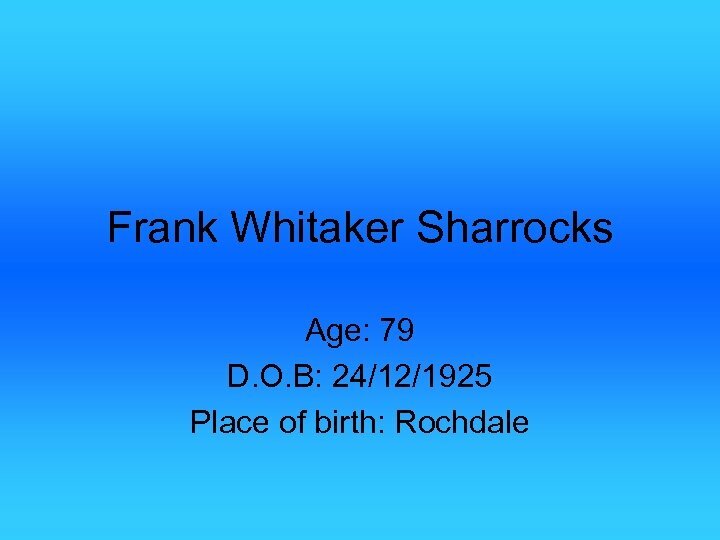 My granddad got along well with his brother and sister. He shared a bedroom with his brother. 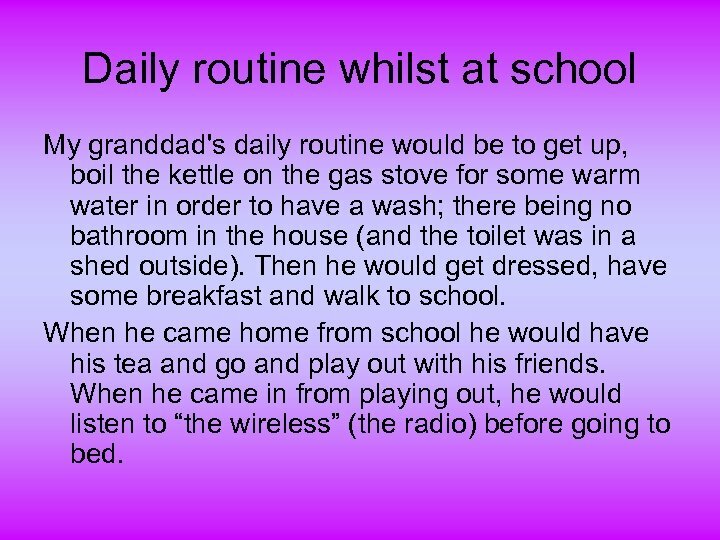 Daily routine whilst at school My granddad's daily routine would be to get up, boil the kettle on the gas stove for some warm water in order to have a wash; there being no bathroom in the house (and the toilet was in a shed outside). Then he would get dressed, have some breakfast and walk to school. When he came home from school he would have his tea and go and play out with his friends. When he came in from playing out, he would listen to “the wireless” (the radio) before going to bed. 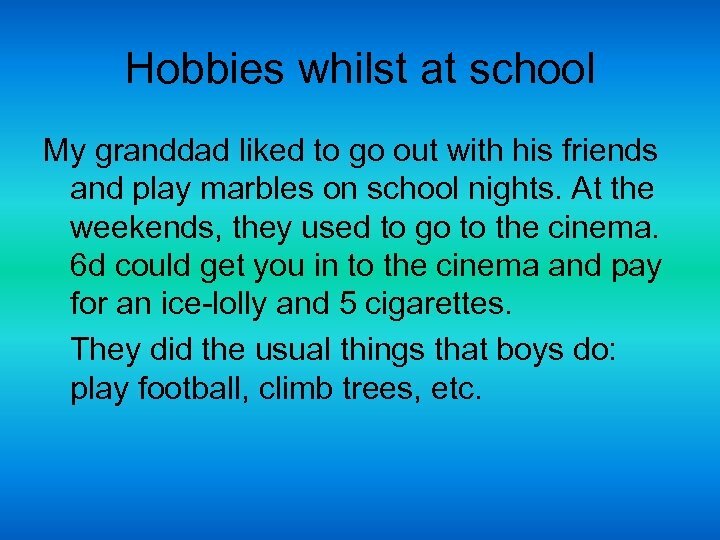 Hobbies whilst at school My granddad liked to go out with his friends and play marbles on school nights. At the weekends, they used to go to the cinema. 6 d could get you in to the cinema and pay for an ice-lolly and 5 cigarettes. They did the usual things that boys do: play football, climb trees, etc. 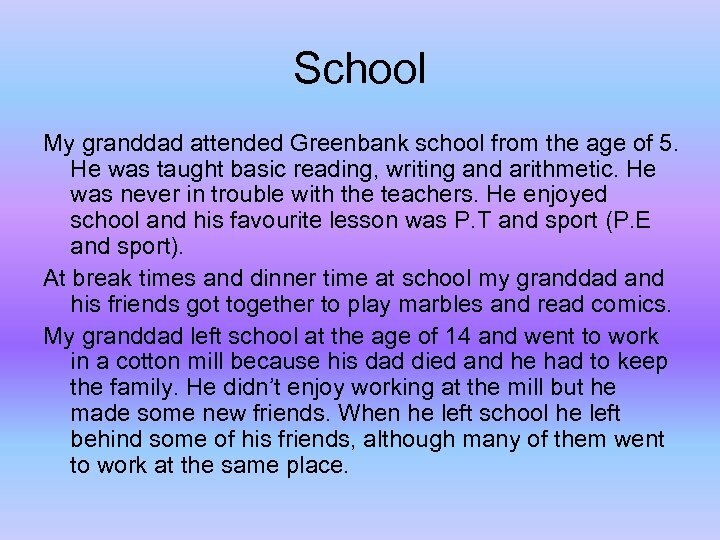 School My granddad attended Greenbank school from the age of 5. He was taught basic reading, writing and arithmetic. He was never in trouble with the teachers. He enjoyed school and his favourite lesson was P. T and sport (P. E and sport). At break times and dinner time at school my granddad and his friends got together to play marbles and read comics. My granddad left school at the age of 14 and went to work in a cotton mill because his dad died and he had to keep the family. He didn’t enjoy working at the mill but he made some new friends. When he left school he left behind some of his friends, although many of them went to work at the same place. 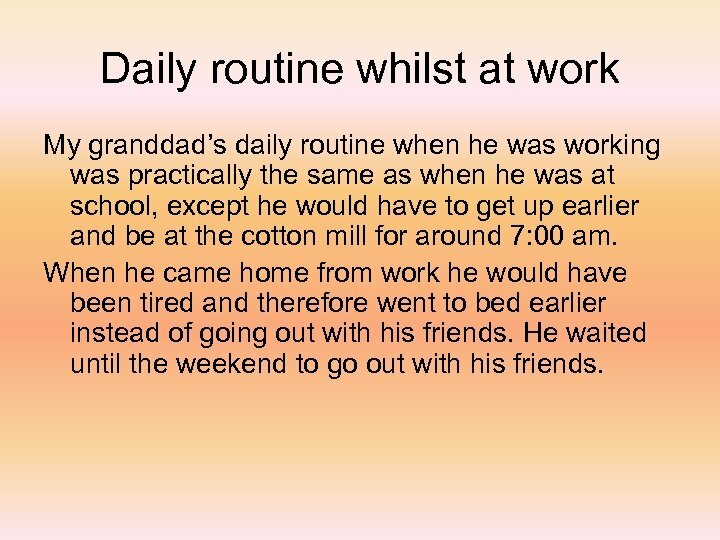 Daily routine whilst at work My granddad’s daily routine when he was working was practically the same as when he was at school, except he would have to get up earlier and be at the cotton mill for around 7: 00 am. When he came home from work he would have been tired and therefore went to bed earlier instead of going out with his friends. He waited until the weekend to go out with his friends. 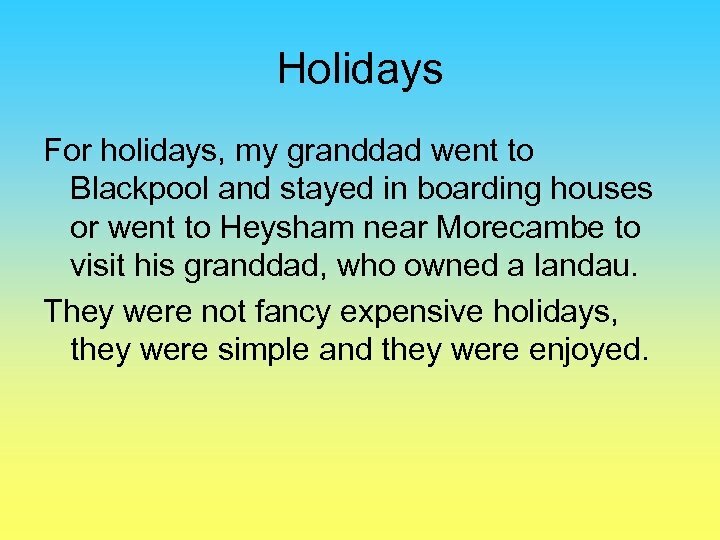 Holidays For holidays, my granddad went to Blackpool and stayed in boarding houses or went to Heysham near Morecambe to visit his granddad, who owned a landau. They were not fancy expensive holidays, they were simple and they were enjoyed. Christmas/birthdays At Christmas my granddad, his sister and his brother got a stocking filled with sweets and small gifts at Christmas. On their birthday they got a small gift. 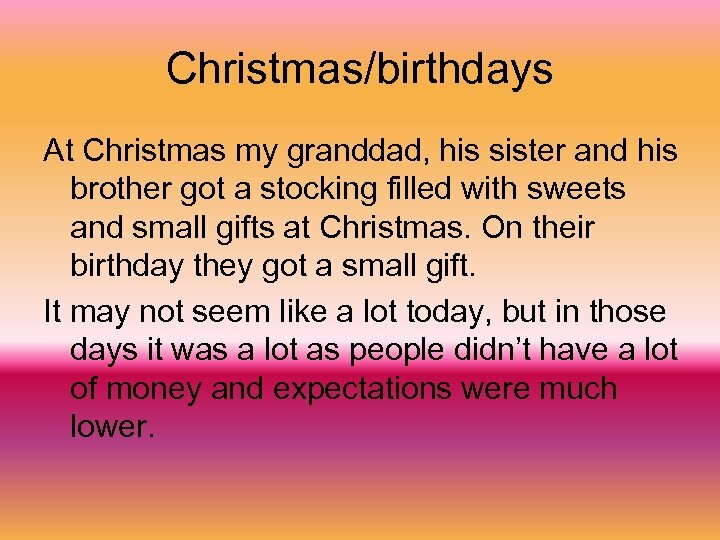 It may not seem like a lot today, but in those days it was a lot as people didn’t have a lot of money and expectations were much lower. 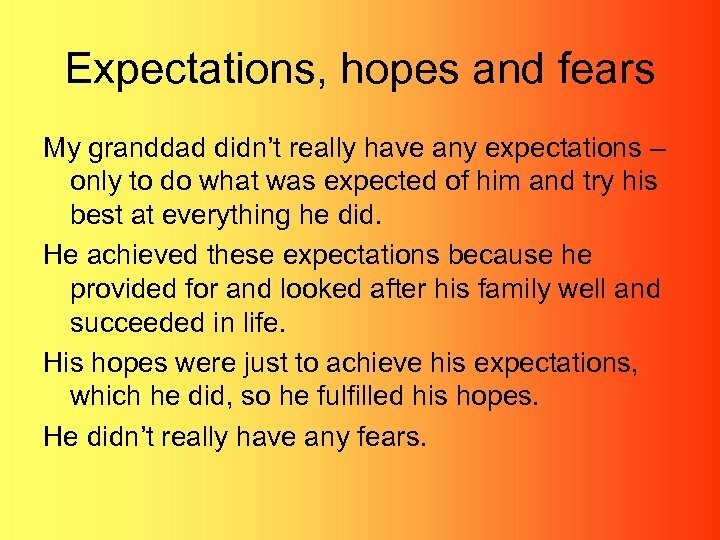 Expectations, hopes and fears My granddad didn’t really have any expectations – only to do what was expected of him and try his best at everything he did. He achieved these expectations because he provided for and looked after his family well and succeeded in life. His hopes were just to achieve his expectations, which he did, so he fulfilled his hopes. He didn’t really have any fears. The Army When my granddad turned 18 he was conscripted into the army. Most people were conscripted apart from those who wanted to join the Regular Army and enlisted. 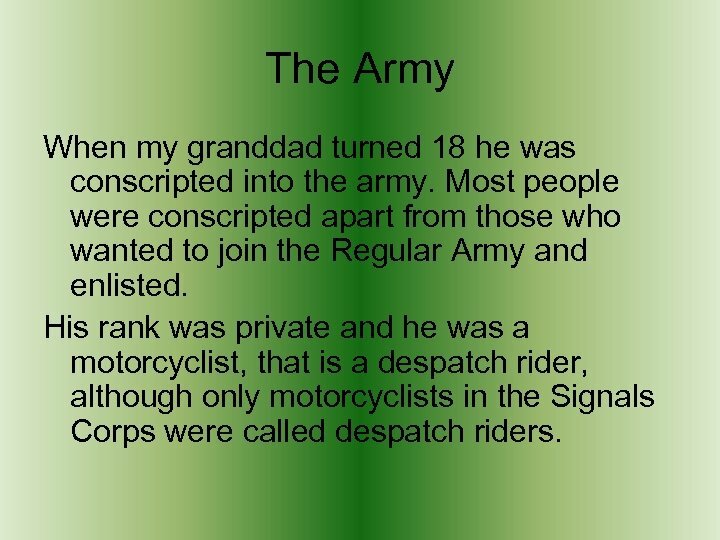 His rank was private and he was a motorcyclist, that is a despatch rider, although only motorcyclists in the Signals Corps were called despatch riders. 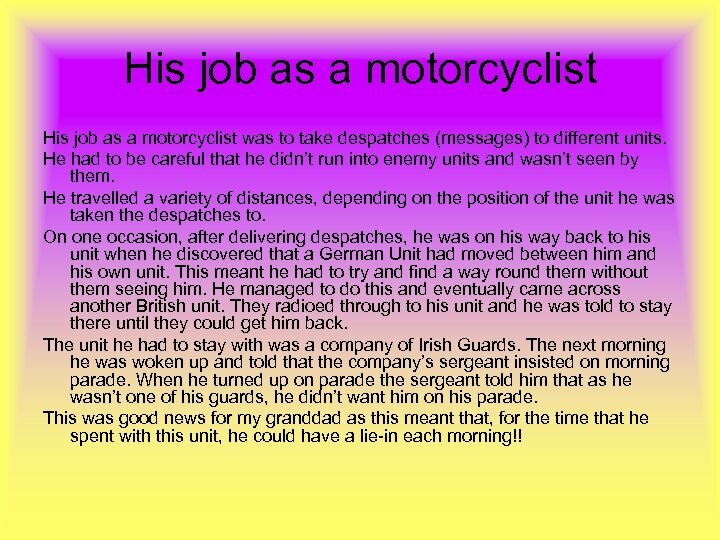 His job as a motorcyclist was to take despatches (messages) to different units. He had to be careful that he didn’t run into enemy units and wasn’t seen by them. He travelled a variety of distances, depending on the position of the unit he was taken the despatches to. On one occasion, after delivering despatches, he was on his way back to his unit when he discovered that a German Unit had moved between him and his own unit. This meant he had to try and find a way round them without them seeing him. He managed to do this and eventually came across another British unit. They radioed through to his unit and he was told to stay there until they could get him back. The unit he had to stay with was a company of Irish Guards. The next morning he was woken up and told that the company’s sergeant insisted on morning parade. When he turned up on parade the sergeant told him that as he wasn’t one of his guards, he didn’t want him on his parade. This was good news for my granddad as this meant that, for the time that he spent with this unit, he could have a lie-in each morning!! 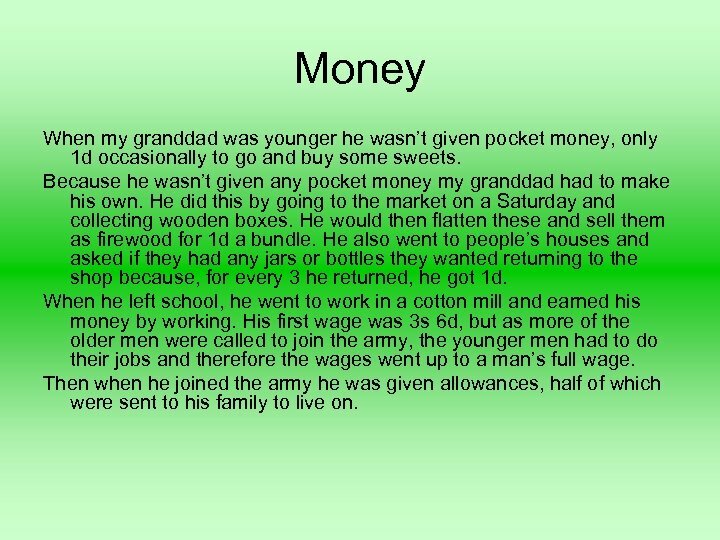 Money When my granddad was younger he wasn’t given pocket money, only 1 d occasionally to go and buy some sweets. Because he wasn’t given any pocket money my granddad had to make his own. He did this by going to the market on a Saturday and collecting wooden boxes. He would then flatten these and sell them as firewood for 1 d a bundle. He also went to people’s houses and asked if they had any jars or bottles they wanted returning to the shop because, for every 3 he returned, he got 1 d. When he left school, he went to work in a cotton mill and earned his money by working. His first wage was 3 s 6 d, but as more of the older men were called to join the army, the younger men had to do their jobs and therefore the wages went up to a man’s full wage. Then when he joined the army he was given allowances, half of which were sent to his family to live on. 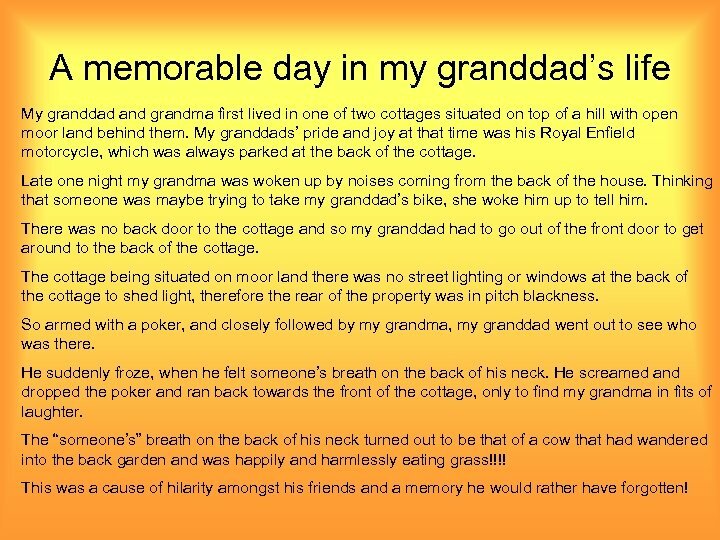 A memorable day in my granddad’s life My granddad and grandma first lived in one of two cottages situated on top of a hill with open moor land behind them. My granddads’ pride and joy at that time was his Royal Enfield motorcycle, which was always parked at the back of the cottage. Late one night my grandma was woken up by noises coming from the back of the house. Thinking that someone was maybe trying to take my granddad’s bike, she woke him up to tell him. There was no back door to the cottage and so my granddad had to go out of the front door to get around to the back of the cottage. The cottage being situated on moor land there was no street lighting or windows at the back of the cottage to shed light, therefore the rear of the property was in pitch blackness. So armed with a poker, and closely followed by my grandma, my granddad went out to see who was there. He suddenly froze, when he felt someone’s breath on the back of his neck. He screamed and dropped the poker and ran back towards the front of the cottage, only to find my grandma in fits of laughter. The “someone’s” breath on the back of his neck turned out to be that of a cow that had wandered into the back garden and was happily and harmlessly eating grass!!!! This was a cause of hilarity amongst his friends and a memory he would rather have forgotten! Pictures!!! 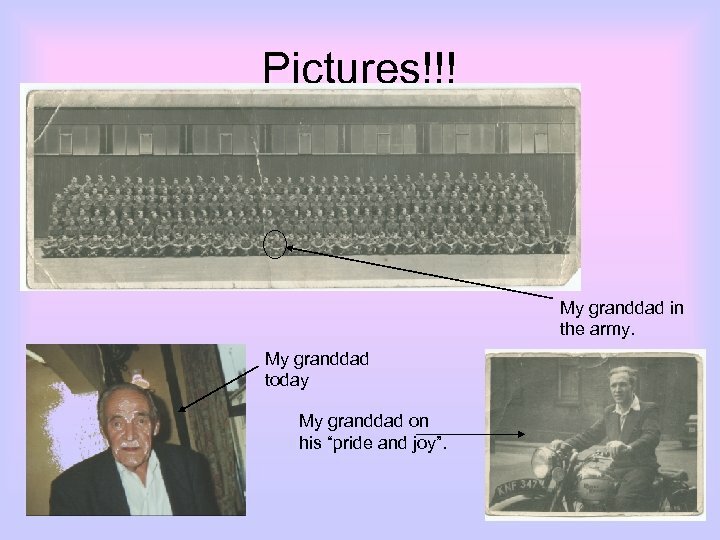 My granddad in the army. My granddad today My granddad on his “pride and joy”.